We strapped a GoPro-style camera to Leo’s back and created this masterpiece. Not dog-related, but I saw Grizzly Bears! I first learned of grizzly bear rafting tours a year ago when I drove through Bella Coola, British Columbia, with my mom, but it was July and the bears weren’t out yet. Rob and I returned for a one-day whirlwind trip with one goal: to see grizzly bears. It’s possible to get there by ferry, but it takes about 20 hours along the inside passage from Port Hardy, B.C., (and first you have to get there). Rob and I flew one hour on a small Pacific Coastal plane from the Vancouver Airport and were met by a staff member from the Bella Coola Mountain Lodge, which also operates the bear tours. Fraser Koroluk and his wife, both biologists, own the lodge and Fraser is the bear guide. Arriving on the banks of the Atnarko, we were hit with the pungent smell of rotting salmon carcasses; familiar to me, less so to Rob. Fraser paddled us and four others down the Atnarko. Pink salmon were still spawning, and we saw the occasional chinook under our raft as well. The most bears they’ve seen on a tour is 20, and that was last summer. Sometimes, they don’t see any. About 10 minutes into our tour, just as I thought we might be one of the unlucky groups not to see any bears, there she was, standing on a log. I felt like everyone on the raft saw her at the same time, but Fraser was concentrating on paddling, so my breathless, “Bear,” alerted him. He’s been calling her Goldilocks, because of some light brown coloring near her face. A single female, Goldilocks likely had mated with a few boars over the summer, and was now eating as much salmon as possible to get fat enough to survive pregnancy, birthing cubs and nursing them during hibernation. Egg implantation in female bears is delayed, so if they don’t gain enough weight, they won’t get pregnant. Since the lodge has been doing these tours for about 14 years, the bears are tolerant of rafts of people floating by, and Fraser is careful to keep a respectful distance. After watching Goldi devour several whole salmon carcasses and wander back into the woods, we continued downriver where we found Coco and her two-year-old cub Rocky on a gravel bar. Other tour groups have witnessed lively wrestling matches between mother and son (which is how Rocky got his name), but they were moving a little slower on this day. Even though Coco won’t have more cubs until Rocky is grown and on his own, they also have to eat as much salmon as possible before hibernation – this gorging phase is called hyperphagia. While Coco swam between gravel bars looking for salmon, Fraser observed that Rocky seemed a little bored. In addition to my utter joy at watching grizzly bears in their natural environment, I really appreciated Fraser’s expertise about grizzly bear life cycles, and these bears in particular. It was also another reminder of the importance of healthy salmon populations. I finally got the Freedom Harness for my doggies! I’ve been wanting to switch from the Other brand of front-clasp anti-pull harness since that company was bought out by a company that sells aversive dog tools. But Leo was really accustomed to that harness. He doesn’t even try to pull when I walk him on it, but does pull if we use a back-clasp harness or clip the leash to his collar. The old harness doesn’t even fit that well – it hangs a little on his chest – but it’s been working. So I was in no hurry to get Leo a new one. Mia is pretty much perfect in every way, and is capable of walking nicely with her leash just clasped to the collar, or with a front-clasp harness, or with a back-clasp harness. Except when she doesn’t. Now and again she pulls. Usually when there’s the scent of deer in the air. After a recent walk around Rob’s parents’ neighborhood when Mia strained against the leash the whole time, I ordered her a Freedom Harness. I had seen it on some dogs at the Pet Expos, and knew it was the one I wanted. Mia’s is rose pink and has a coordinating 10-configuration, double-ended leash. While Mia is a candidate for no-hands leash walking (except when there’s deer in the air), she walks best with the leash fastened both to the front and back. When you order online, Jessica MacDonald, inventor of the Freedom Harness, asks your dog’s weight and chest girth, and pre-sizes the harness. Quite handy, because the fit is very precise. I especially love the velvety fabric of the strap that goes across the chest. So I went ahead and ordered one for Leo in kelly green. It fits him much better than his old harness. The Freedom Harness is designed so that the “control loop” on the back signals to the dog to stop pulling. Since Leo is very used to having a similar loop on his chest, he pulls a little bit more with this new harness, but he’s learning. A cool feature of the 10-configuration leash is the detachable handle. I took the dogs to a beach where I used to let them run off-leash until Leo lost his privileges. Since then, I’ve clipped a long lead to his collar. Now that I have these longer, double-ended leashes with detachable handles, I can walk the two of them together from the parking lot to the beach, by attaching one of the handles to the ends of both leashes. Then, I can let Mia off leash and attach the leashes together, with a handle at one end, creating a long line for Leo. If I want to let him go in the water and drag the leash, I can detach the handle so it doesn’t get wet. Genius. Here’s Leo draggin’ his leash(es) over a piece of driftwood that looks like a dragon. Please enjoy the FitDog Friday Blog Hop brought to you by SlimDoggy, To Dog with Love and My GBGV Life. Join the Hop or just enjoy the links below – lots of fun fitness tips and advice! The theme for this month’s Positive Pet Training Blog Hop is training mistakes. Before I caught on to this whole positive training thing, I made so many mistakes that I wrote a book about them, called Bark and Lunge: Saving My Dog from Training Mistakes. Everyone makes technical mistakes, like using the wrong gear, or using the right gear in the wrong way. Beyond those, one of the fundamental mistakes I made was trying to get Isis to fit the mold of the dog we wanted her to be, instead of putting her needs first. As I write this, Rob and Mia have gone out for a beer together. Leo and I are sitting on the back patio, where the air is cool against my arms, in contrast to the gust of hot air that greeted us when we came in the front door. I would love to take Leo with us to cafes and patio bars, but that would be for our own enjoyment, not his. Leo doesn’t require a ton of stimulation or exercise, but we take him somewhere every day. We cheat with the dog park during the summer, because there’s too much activity on the streets during these long summer days. It’s tough for a leash-reactive dog. Tonight, we did half and half. We drove to an off-leash field that Leo walks in and out of on leash. The flaming orange sun hung behind a thick haze from nearby wildfires. We saw three other dogs one at a time. I made small talk with one woman, who might have found it odd when I told her my boyfriend was having a beer with our other dog. After she and Checkers left, the crispiness of the field made me think of a post-apocalyptic wasteland. Some of my best walks with Leo are like this: solitary. I remember one around our neighborhood in the rain, where I felt like we were on patrol. Leo would be a really good Apocalypse buddy, especially since he wouldn’t have to be on leash. Nights like this make me happy, and remind me how low maintenance Leo really is. I know a lot of people had a hard time over the weekend with fireworks. Our dogs aren’t afraid of them, but Leo barks at the noise. I hate the noise more than he does. Handy little item Banfield is giving away. Lets you know when it’s too hot for a dog inside your car. Also raises awareness when others walk past your car. The other problem we’re having is the heat. Last year, we took the dogs to Port Townsend for July Fourth weekend. I remember being thrilled that it wasn’t too hot to leave the dogs in the car while we went inside places to eat. We always parked within sight of our table, and left the windows down, but one of the pleasures of the Pacific Northwest is that it is rarely too hot to leave a dog in the car. For a short period. That has not been the case this year. We’ve had a couple of weeks already of record-breaking temperatures that not only make it unsafe to leave your dog in the car, but also prompt warnings about walking dogs on hot pavement. I wouldn’t have thought that 80-90 degree temps would make it too hot to walk dogs on pavement… until I stepped onto my own patio barefoot the other day. A dog trainer friend commented that she saw two people running their dogs in the middle of the day and that the dogs were very clearly stressed. Probably those people thought their dogs needed the exercise; probably they mistook their dog’s panting as a good sign, not of heat exhaustion. Or maybe they’re such obsessive runners that they didn’t give a second thought about whether it was good for the dog or not. I don’t run, but I had just recently walked Mia at noon. We were on a woodsy path, not pavement, most of it shaded by trees, but I did wonder if it was too hot for her. That was a reminder to me to put Mia’s needs first. Maybe she doesn’t need a half-hour walk at noon on a record-breakingly hot day. And when we do take the dogs out at the hottest part of the day, we make sure it’s someplace like the Best Dog Park, where they have kiddie pools and a hose. Positive Reinforcement Pet Training Week is hosted by Cascadian Nomads, Rubicon Days & Tenacious Little Terrier. This month we are sharing stories of our flaws as trainers. Like every month, any and all posts or comments about positive reinforcement pet training are welcome. The blog hop is open all week, so if you are a blogger, add a post and if you are a positive pet training enthusiast, hop around by clicking the thumbnails below, learn and share. Next months Positive Reinforcement Pet Training Week begins August 3rd and the theme is improving our pet training skills. 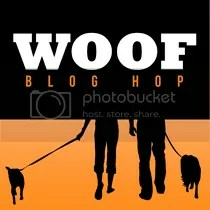 Welcome to the latest WOOF Blog Hop. We’re Working Out Our Fears about holiday challenges! We put our presents on top of Leo’s hut instead of under the tree. He’d open them otherwise. My biggest challenge is leaving the dogs behind. My preference is to spend every single second with Mia and Leo. They’ve gotten so well-behaved when we take them to Rob’s parents’ house. As long as we put the butter in the microwave and out of Leo’s reach, he doesn’t get in any trouble at all. Not since last Thanksgiving, when he made off with a turkey drumstick after we finished eating. Leo gets his own couch at the grandparents’. This year, Rob and I are going to see my family in Southern California. Fortunately, Rob’s dad, Jerry, is the best ever dog sitter and stays at our house. Even though his own TV is twice as big, I think Jerry enjoys spending quiet evenings here with Mia and Leo, watching Netflix on our 40-inch TV. I was feeling kind of guilty for making him stay here Thanksgiving eve and Thanksgiving night, but actually, maybe he’s happy to get out of whatever Black Thursday shopping Rob’s mom has in store. We’re a little too reliant on Jerry when we go out of town, which became clear last month. We had two weekend trips planned for October and I had just purchased our Thanksgiving plane tickets when we learned that Jerry had to have surgery on one of the weekends we planned to be gone. At first, Rob’s mom, Alice, said she’d stay at our house that weekend, but that quickly became ridiculous. We decided to board Leo at a place he’s stayed before where dogs get to play outside during the day. I’d hate for him to be kenneled all day. Leo is such a live-in-the-moment kind of guy, I think boarding him is harder on me than it is on him. Because we had to leave early for the airport, we imposed on Alice to drive Leo to and from the boarding facility. This worked out great for me, because I didn’t have to suffer the agony of leaving him in the play yard and driving away. When Alice came to the phone, she described Leo sitting on the front seat of the truck. “He’s so tall!” I pictured long, lean Leo, head almost touching the car roof, smiling out the window, and that image replaced the lonesome one I’d been holding onto since we left the house. My chest relaxed. I actually shed a little tear. That left Mia, once believed to be our perfect dog, but lately revealed to be a house-destroyer. It’s possible that Mia would be fine if she were boarded with Leo, but more likely she’d squeak and whistle and cry, and possibly tear apart the walls of the kennel. I know how lucky we are to have such wonderful dog sitters. My chest doesn’t have to be in knots the whole time I’m away from them. Still, I always feel most relaxed and safe when we’re all home together. What do you do with your dogs when you have to be away? Does it break your heart to leave them behind? Is it harder on you than it is on them? Do you have a reactive or fearful dog? Please join us and share your story. The Blog Hop is open through Sunday, November 16, hosted by Oz the Terrier and Wag ‘n Woof Pets. Whenever I’m preparing for a trip, I get a twisty, angsty feeling in my chest because I hate leaving my dogs behind. Lots of places in the Pacific Northwest welcome dogs, but they wouldn’t necessarily welcome leash-reactive Leo. Since I don’t consider it socially acceptable to take him on walks where he barks and lunges at our neighbors, I hardly consider it socially acceptable to take him to a crowded dog-friendly campground or motel. Chevy Chase Beach Cabins and the adjoining beach is a haven for dogs! We allow dogs at Chevy Chase Beach Cabins because we are dog lovers ourselves and love to vacation with our furry friends! Dogs are welcome in all seven of the cabins, and the beach is private. Scout is the resident dog at Chevy Chase. We were lucky to inherit Scout from the previous owners (life is too good for her here, no one could picture her as a city dog!). Scout is very friendly, loves children, tolerates other dogs, and loves meeting and greeting guests. My fantasy was that the grounds would be one big dog park situation, where leash-reactivity would not be an issue. Leo is well socialized and plays nicely with other dogs off leash. He only barks and lunges at them when he’s on leash, sees them from afar and can’t get to them. This is called barrier frustration. We booked an adorable yellow cabin for two nights. No one was around when we first arrived. We strolled downhill to the private beach, which was everything I hoped it would be. I’ve let Leo run free at an uncrowded beach before, dropping his leash and letting it drag. Here, we truly let the dogs off leash and they romped in the water. No joggers or bicycles lured him into temptation. Back at the cabin, we needed to let the dogs dry off before we let them inside. Mia remained off leash, we tethered Leo to the cabin door with a 30-foot leash, and we sat in the Adirondack chairs on the porch. Total perfection. Until a landscaping lady, to whom Leo already had been introduced, headed straight for us. Guess who barked at her? And guess who got anxious when the guests in the other cabins returned? Me. It was me who got anxious. These guests included several small children and no large dogs. When the first little girl raced for the tree swing near our cabin, I hustled Leo inside. Was that my plan, to run and hide every time another guest went by? No, I remembered. I brought cheese for this very reason. I took Leo back outside and gave him cheese every time a new person came into view. He smiled, took the cheese calmly, and didn’t bark at any of the strange people. Not even when they ran. He did, however, bark at people who walked by our cabin when we were inside. And he barked at Scout, the resident Lab mix. I had gotten so excited by the description on Chevy Chase’s website that I glossed over a code word: tolerates. Scout merely tolerates other dogs. She had no interest in playing with Leo and Mia. She lurked in the yard by the main house, as was her right, and every time he saw her, Leo barked his scary bark. But this weekend away was about the best an owner of a reactive dog can get (without the angsty feeling of leaving the dog behind). Leo got to do fun things like romp off leash on a beach. We sat in the sand and read our books with our dogs beside us. If the worst thing Leo did was startle a few people by barking from inside our cabin as they walked by, I’ll take it! We found a fairly secluded spot that was exceedingly dog friendly. I used potential triggers as opportunities to counter-condition Leo. Epilogue: Leo usually wears a Calming Cap in the car, but we took it off him for the long winding island road, not anticipating we would see so many bicycles. I created a secondary reinforcer by saying, each time Leo noticed a bicycle, “Cheese, cheese, cheese, cheese, Good boy!” I had no cheese in my hand at the time, but it did have a reassuring effect on him, and now I’ve added that cue when I give him cheese in the presence of bicycles. Do you have a reactive or fearful dog? Please join us and share your story. The Blog Hop is open through Sunday, August 17, hosted by Oz the Terrier and Wag ‘n Woof Pets. One of the many perks of BarkWorld was a magnificent swag bag, which included $25 gift cards for pet-sitting via Rover.com. Rover.com is Hotels.com for your dog, connecting you with pet caregivers in cities all over the United States. I’m giving away two gift cards. That’s $50 of pet-sitting! Before I had dogs, I was the single mother of an iguana named Emerald. He moved with me from Los Angeles to Chicago, to Alexandria, Va., back to L.A., to Burlington, Wash., then Olympia and Bellingham. In Chicago and Washington, I had friends to stop by and feed him when I was out of town, but I moved to Alexandria just before Christmas and knew no one who would be around while I was back in L.A. for the holiday. The year was 2000 and I found my pet-sitter in the phone book (the Internet had already been invented but I don’t think it had replaced phone books yet). After meeting her briefly, I wasn’t remotely concerned that this stranger would steal of my stuff; I had just moved there and didn’t have any valuables (aside from Emerald). Worst case scenario, she wouldn’t feed him and I’d come home to a very hungry lizard. She definitely came by at least once, because she left behind a pair of leather gloves. Nowadays, of course, you’d find an iguana-sitter online, and that’s what Rover.com is all about. You can find dog walkers, doggie daycare, sitters to stay at your house, and people who will take your pets into their homes, all for a range of prices. Older couples, college students, teenagers. Take your pick. 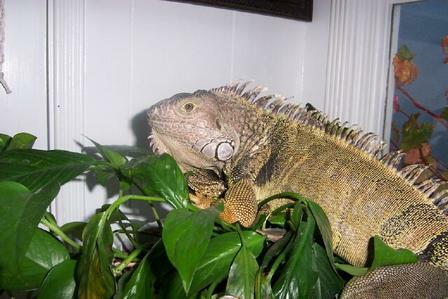 Even though I don’t have an iguana anymore, I was delighted to find a listing near me for a sitter who cares for exotics as well as cats and dogs. Like anything online, you want to make sure you’re dealing with trustworthy people, so you’d want to meet your sitter face-to-face before giving them a key and your itinerary in Barbados. Rover’s reviews also are helpful in that regard. We boarded Leo at a place with a big fenced yard, because he’s such a handful, but I couldn’t bring myself to do that to Mia. We’d only had her a few months; how could I explain to her that she wasn’t being abandoned again? So we had a pet-sitter stay with her, and that worked out perfectly. Rover CEO Aaron Easterly spoke at BarkWorld about the changing trends in pet care and technology. The biggest takeaway for me was that a recent poll found 76 percent of people with dogs considered themselves to be dog parents, rather than dog owners. Makes perfect sense, then, that people prefer for their babies to stay in homes, rather than cages. To win $25 toward pet-sitting through Rover.com, comment below and tell me about your Adventures in Pet-Sitting. Then, “like” the Facebook page for Bark and Lunge, and enter there to win a second $25 gift card. Contest ends at 11:59 p.m. Wednesday, Sept. 11. One winner randomly selected from each list of comments will be announced Thursday, Sept. 12.